Here at We Are Wildness, over the last several months we've been working on developing a program to encourage getting children outside. You may be familiar with the Rewild Your Life 30 day Challenge, and we decided it was time to expand our offerings to include the entire lifespan. 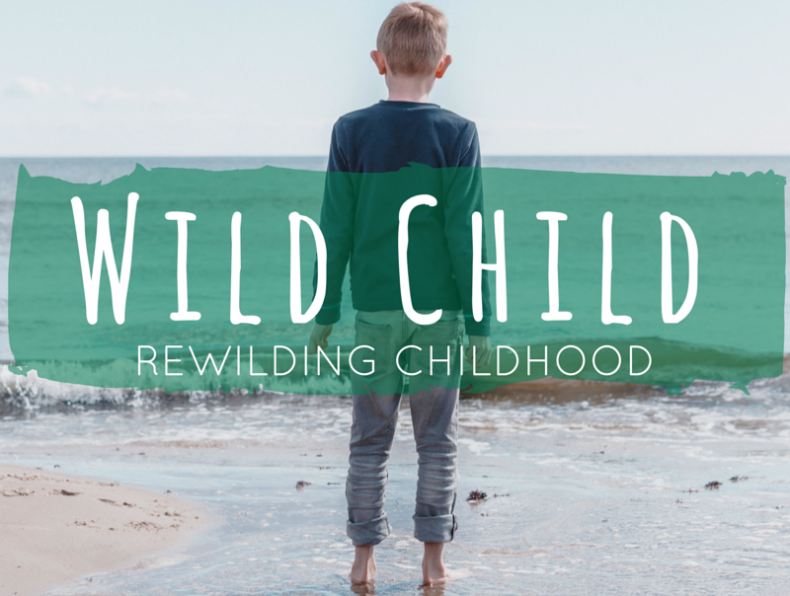 We've titled this new challenge "Wild Child: Rewilding Childhood," and we're pretty excited about putting it out into the world. On one hand, it seems a dichotomy to offer these web-based nature challenges -- programs designed to get folks outside that are...virtual? Well, in a word, yes. As much as we sometimes don't like to acquiesce to technology, the fact is that 'being online' is part of modern life as many know it right now. So the hope is that by developing online programs, we'll be reaching people who maybe wouldn't normally just choose to visit the local nature center or take off on a hike in the woods. Or the parents who remember fondly their youthful adventures outdoors but notice their offspring looking at an iPad more often than the sky while swinging from backyard tree branches. Or the teachers that love getting outside, but tend to feel like other things need to take priority. Along with anyone else who wants ideas and support in doing things differently. The list could go on. But however we reach whoever we reach, we're excited to be part of the movement to rewild childhood. Developing a deeper connection to nature is something everyone can benefit from, no matter what our age, but it's especially essential for children. Anxiety, stress and hyperactive tendencies tend to melt away as children take time away from the modern man-made world and absorb Nature through all the senses. There can be noticeable change in a child's body, mind and spirit. By taking them outside regularly, we can offer the children in our care a foundational component of leading healthy and grounded lives. Having support is essential to making any change in habits last! Within the challenge, there is opportunity to meet new friends, groups and families who are figuring it out as they go, too. Be inspired by the experiences and posts of others and offer inspiration as the journey continues. Find motivation in staying connected with Nature by walking along side others-even from afar- who share similar values. Development of Respect for Nature: The more time young people spend outdoors, cultivating a relationship with the natural world, they more likely they are to grow into adults that love and respect the Earth and all of the life that makes this planet home. And that's something that we need right now, more than anything. “The physical exercise and emotional stretching that children enjoy in unorganized play is more varied and less time-bound than is found in organized sports. Playtime—especially unstructured, imaginative, exploratory play—is increasingly recognized as an essential component of wholesome child development." Maybe you'll hike a trail, maybe you'll run through a grassy field, maybe you'll go to the beach. Maybe you'll go on a wilderness vacation, but maybe, and perhaps this is even more essential than a deep wilderness experience, you and your little ones will just sit in the front yard and watch the clouds go by. The objective of this challenge is to make spending time outside part of the norm-part of what is essential for the days of the children in your care. We think you might be surprised at what you learn about the earth and yourself along the way.